Many nonprofits, particularly smaller organizations, say their biggest challenge to using social media effectively is that they don’t have the time or staff. Those that have opened themselves up to using these tools and connecting with passionate people in their networks find abundance. Here’s one story about how one free agent, a social media savvy volunteer for a local food bank, saw a problem, reached out to her network, and helped solved in collaboration with the local nonprofit. Sue Kerr has put her social media savvy to work to fight hunger in the Greater Pittsburgh area and save the environment. In 2009, she was live tweeting a food distribution event at the Greater Pittsburgh Community Food Bank when she noticed a man leaving the food bank juggling a lot of thin plastic grocery bags filled with food donations. One bag split and a cabbage rolled out onto the sidewalk and he chased after it. That’s where she got the idea that food banks should be using canvas tote bags to distribute foods and she tweeted her idea. To her surprise, the Pittsburgh Foundation was following her live tweets. Christopher Whitlatch from the Foundation responded to her tweet with that had a few bags they could donate. Not too long after that, the Pittsburgh Tote Bag Project was launched. The Pittsburgh Tote Bag Project collects gently used tote bags for distribution to the region’s food pantries. They partner with the Greater Pittsburgh Community Food Bank which coordinates distribution of the bags along with food. The Food Bank serves 11 counties and more than 120,000 people each month (about 1.9 million pounds of food) through a network of more than 300 pantries The project receives bags from a network of permanent drop-off spots, informal and formal tote bag drives (with or without food) and corporate donations of excess schwag. Sue has also collaborated on social media activities with the food bank. Says Sue, “Beyond tagging and shout outs on Twitter, we organized Pittsburgh’s first ever #blogmob (play on flash mob) , inviting local foodie bloggers to come out to the Food Bank for a tour, a chance to observe a food distribution, and general discussion. We plan to repeat every September to honor Hunger Action Month.” Says Sue, “Our hope is to develop a model that can be replicated in other communities.” The project freely shares its lessons learned with other groups that want to run similar drives. Has your organization discovered and worked with a free agent like Sue? 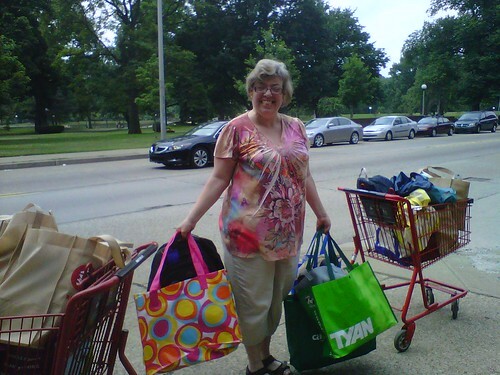 Greater Pittsburgh Community Food Bank appreciates the support of the Tote Bag Project! Thanks, Sue!